↑ Flemming, Laraine E. (Jan 1, 2016). Reading for Results. Cengage Learning, Jan 1, 2016. p. 721. ISBN 9781305500525. ↑ Montagu, Ashley (1999). The Natural Superiority of Women. Rowman Altamira. p. 217. ISBN 9780761989820. ↑ Heller, Nancy (2000). Women Artists: Works from the National Museum of Women in the Arts. Rizzoli Intntl. p. 64. ISBN 0-8478-2290-7. ...one of the few art academies in France open to female students. ↑ Runco, Mark A.; Pritzker, Steven R. (May 20, 2011). Encyclopedia of Creativity. Academic Press. p. 763. ISBN 9780123750389. ↑ Mahon, Elizabeth Kerri (2011). Memories of Our Lost Hands: Searching for Feminine Spirituality And Creativity. Penguin. pp. 37–38. ISBN 9781101478813. ↑ Schmoll gen. Eisenwerth, J. Adolf (1994). 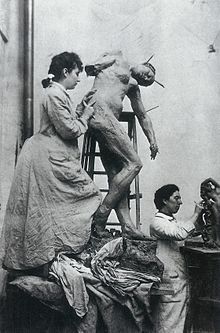 Auguste Rodin and Camille Claudel. Prestel. p. 109. ISBN 9783791313825. ↑ Mahon, Elizabeth K. Scandalous Women: The Lives and Loves of History's Most Notorious Women. ↑ The different scales, the different modes of plasticity, and gender-representation, of the three figures which make up this important group, enable a more universal thematic and metaphoric stylistics related to the ages of existence, childhood, maturity, and the perspective of the transcendent (v.
↑ Rodin, Auguste; Crone, Rainer; Salzmann, Siegfried (1997). Rodin: Eros and creativity. Prestel. p. 41. ISBN 9783791318097. ↑ Caranfa, Angelo (1999). 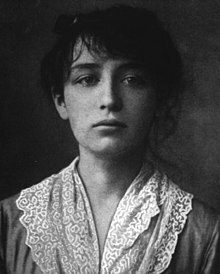 CamilleClaudel: A Sculpture of Interior Solitude. Associated University Presse. pp. 27–28. ISBN 9780838753910. ↑ Akbar, Arifa (2012). "How Rodin's tragic lover shaped the history of sculpture". http://www.independent.co.uk.